Bedrich Smetana "Piano trio in G minor"
I must admit that Bedrich Smetana (1824-1884) is not one of those composers I go around mentioning or hear brought up in conversation much. In fact, the name didn't even sound familiar when I first started researching this piece. However, his 'Piano Trio in G minor" is familiar, and the story of it's inception is worthy of a post for this blog. Smetana was a Czech composer who lived in the 1800s. A pianist foremost, he gave his first public performance at the age of 6. He began writing orchestral work in his early 30's and continued to compose until a year before his death at age of 60. Outside of his homeland he is best known for the opera The Bartered Bride and the Moldau from the song cycle Ma Vlast. 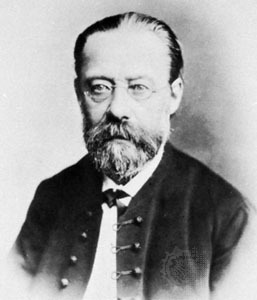 Smetana married his childhood friend Katerina Kolarova in 1849. They then had 4 daughters between 1851-1855. Tragedy struck in 1854 when his 2nd daughter died of TB, then in 1855 his favored eldest daughter Bedriska died of scarlet fever. It was in the midst of this grief that he wrote the Piano Trio in G minor in memory of Bedriska. The piece took 2 months to write and premiered Dec. 3, 1855 with Smetana himself as the pianist. The piece is written in three movements with three voices of piano, cello, and violin. The first movement, "Moderato assai' communicates Smetana's emotional anguish, opening with a violin solo that I find truly haunting. This motif continues throughout the first movement echoed by both cello and piano. It is often not subtle, and if you listen it feels as if the grief is angry or about to burst. The cello attempts a 2nd motif, as a solo around minute 2 of the video below. Though still sorrowful, it seems more controlled, an outsider perhaps speaking reason to the unabashed 1st motif. The second movement 'Allegro ma non agitato' strays from the usual style of having the second movement slow like an adagio. It is in fact more of a polka-like allegro, and is said to be written more as a dedication to his daughter, absent the emotional grief. You'll hear the first motif from the 1st movement played at the beginning in staccato fashion. It certainly looses some of the sadness when played in this fashion. The final movement, 'Finale: presto' starts off with restless energy with themes borrowed from earlier works that Smetana wrote. As this movement is to give closure to his daughter's death, I find it interesting that 3/4 of the way in (around min. 6:35 below) one of the secondary themes evolves itself into a funeral march (7:10 especially) and then just as suddenly we're back to the impassioned quick paced melody from the beginning of the movement with the biggest surprise, ending gustily in the major key of G (less gloomy, perhaps grief resolved). The listener may have the distinct impression that this piece is the story of his grief, rather than being in the midst of his grief. This may be because we know historically that he re-worked the Piano Trio 2 years later. I wonder how different that original piece was, played just months after his daughter's death than the version heard today. Below are the three separate movements in order from YouTube. If you have little time, I'd encourage you to at least hear the first 30 sec's of each, to sense the difference. Fabulous, beautiful, captivating music. Thank you, Dr. Amy!